We all know the following Mother Goose rhyme: Jack be nimble / Jack be quick / Jack jump over the moon. Wait! Something’s wrong here. Wasn’t it the cow that jumped over the moon? Indeed, nursery rhymes sound the depths of our childhood experiences, but they serve as far more than fond memories. The nursery rhyme has been a training ground for English speaking children for the past 400 years or perhaps longer. Mother Goose was the first “holistic educator,” because nursery rhymes teach to every aspect of a child’s nature: sensory, physical, cognitive, and moral. We can say with assurance that Mother Goose was far ahead of her time. The mythical figure of Mother Goose is usually depicted as a crone who presides over the treasury of English nursery rhymes which has evolved over past centuries. 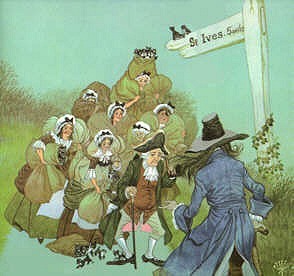 The earliest reference to her is in a collection of French stories in 1650, but the name came into its current usage in 1780 after a British publisher adopted it in reference to a “compilation of traditional English nonsense songs and rhymes.”[i] The tradition of Mother Goose was carried across the pond to the American colonies, where she has steadfastly remained the reigning denizen of early childhood literature. There are several reasons for the unwavering popularity of her verse; investigating them gives insight not only into the poems, but into the nature of children, and more specifically, into the ways in which children can and should develop. The first and most important function of the rhymes is that their insistent sing-song rhythms immerse the very young in the cadences of the English language. The rhymes prepare inexperienced ears to recognize not only specific words, but entire phrases, laying down the neural pathways for children to aurally receive, process, and finally, organize the more detailed, chaotic information which will soon bombard them as they grow past toddlerhood and move into the world of cognition and reason. Take the well-known Here We Go Round the Mulberry Bush—this ditty repeats the phrase “the mulberry bush” three times within four lines, with each repetition varying the tune and pitch slightly. Why? By retaining the same words while slightly altering the tune and placement on the musical scale, the phrase takes the child incrementally from the “known” to the “unknown”—this is foundational to the way that we learn. As they chant, the children run around an object, developing physical abilities in tandem with tonal memory. The content of this rhyme is irrelevant, but the repetitive nature of the words, with their sing-song lilt, provides children with a now-familiar milieu in which to learn; their auditory world becomes a known haven which yields a sense of security through its limited phraseology and repetition, while acting as a vehicle through which they refine their ability to distinguish differences in sounds. The rhymes also provide children with information about the world around them. Mother Goose “educates” by creating touchstones for their expanding minds. For instance, many are about foods in the household. “Pat-a-cake” explains the baker’s wares; “Little Jack Horner” glorifies the Christmas plum pudding (and Jack’s thumb! ); silly Jack Sprat and his wife exemplify fat and lean; the “little piggies” go to market looking for roast beef, etc. Nursery rhymes also familiarize children with commonplace items in an entertaining manner. A cat plays a fiddle, a cow jumps over the moon, dishes and forks run away together . . . amazingly, this simple technique causes children to begin to make connections between and among objects, developing their analytical processes through the use of the furnishings of their everyday world. 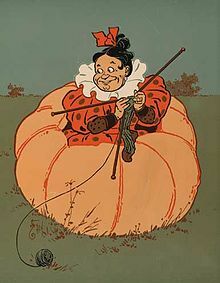 Or take Peter, Peter, Pumpkin-eater, in which Peter cannot “keep” his wife until he places her in a pumpkin shell (!). Learning humor is a crucial aspect of developing critical thinking, and helps children to learn to differentiate between various aspects of the world around them, as they note the contrast between the joke-rhyme and the real world it supposedly reflects. Mother Goose rhymes also inculcate morals and rules in children by using a form which they will easily remember, as in this sardonic scolding of a child for his tardiness: A dillar, a dollar, a ten o’clock scholar! / What makes you come so soon? / You used to come at ten o’clock / But now you come at noon. Or this one: Seesaw, Margery Daw / Sold her bed / And laid upon straw. And we all know about what happened to Jack and Jill when they ran up the hill, and it wasn’t pretty! While some lessons Mother Goose teaches might seem grim to us (Ladybird, Ladybird, fly away home / Your house is on fire, your children all gone!) they were necessary helps to children of previous generations, who lived in a harsher environment where these admonitions were necessary. However, There’s a Neat Little Clock is charming even to the 21st century mind: There’s a neat little clock- / In the classroom it stands- / And it points to the time / With its two little hands. / And may we, like the clock, / Keep a face clean and bright, / With hands ever ready / To do what is right. Do you know the answer? Actually, it is unclear. Perhaps only one person was going to St. Ives, since the speaker states in the beginning that he is going there. Or perhaps everyone is headed that way, including the animals. Then there would be 2,802—talk about a traffic jam! It’s even possible that the last line of the riddle is only asking how many of the party he met were going, and doesn’t mean to include him in the question, in which case it is possible that zero could be the answer. This rhyme is actually a form of a riddle from 1650, BC called The Papyrus Rind[ii]–what better way to introduce children to the vagaries of language than that of a timeless logic problem hidden in a nursery rhyme? Mother Goose has remained with us these many centuries because she is worthy of the honor; she is a teacher par excellence, an iconic and insightful culture-bearer who inculcates deep lessons into our Western heritage. Let us adopt her and say wholeheartedly: Welcome, Thou Beloved Crone! Briggs, Raymond, The Mother Goose Treasury. Coward-McCann, Inc. New York: 1966. Mother Goose Anniversary Edition, The. Scholastic Inc. New York: 1916.